They are both found in the Afar Region of Ethiopia and are part of the East African Rift System – an active tectonic plate boundary that’s splitting apart plates at a rate of 7 mm per year. The combination of this area’s geology and environment make it a uniquely extreme place to do research. 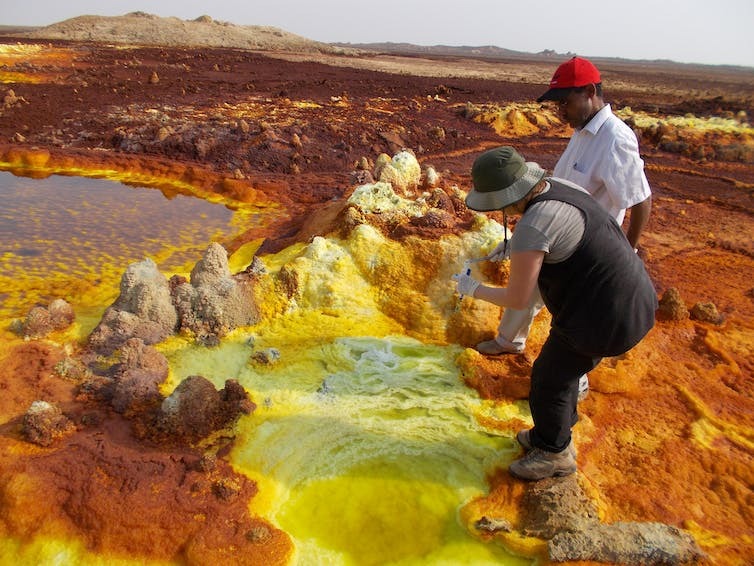 In collaboration with the Europlanet research team, I am investigating the geological and biological aspects of the Danakil Depression. Our aim is to study microbes, specifically extremophiles – organisms that thrive in extreme environments. They can live in hot springs, acidic fields, salty lakes and polar ice caps – conditions that would kill humans, animals, and plants. Their existence suggests that life can develop mechanisms to withstand physical and chemical conditions like those on the planet Mars. There’s no other natural environment like it. What we have found at the site is a combination of extreme physico-chemical parameters. Toxic gases saturate the air, the pH is extremely acidic and saline and metal concentrations are very high. In these extreme ecosystems we expect to find microbial life in the form of extremophiles, polyextremophiles and potentially new forms of polyextremophiles – these are extremophilic organisms that can tolerate, or adapt, to a combination of physico-chemical parameters. This harsh environment was created by the splitting apart of the old African Plate into two plates – the Somali and Nubian Plates. In millions of years, these two plates will be definitively separated and a new ocean basin will form. Much of the 40km by 10 km Danakil Depression lies between 150-100m below sea level. It’s therefore one of the lowest land areas on Earth. 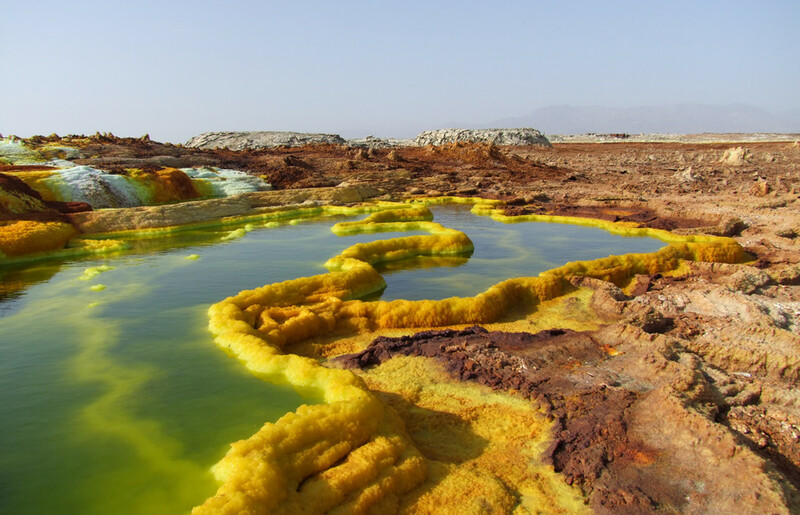 The Dallol volcano, in the northern part of the Danakil Depression, was formed in 1926 by a phreatic eruption. This is when groundwater is heated by magma – essentially, a steam eruption without the lava ejection. Dallol has an elevation of approximately 50m below sea level. Barbara Cavalazzi collects samples at Dallol. The Depression is known as the hottest place on Earth. It’s classified as a hyperarid climatic zone and is consistently hot throughout the year. In the Dallol, because of the area’s geothermal activity, the average daily temperature is 45°C. I have registered a temperature there of 55°C – when I had to stop working! The region’s precipitation ranges is very low with an average annual rainfall of only 100-200 mm. In the dry areas of South Africa there would be an average annual rainfall of at least 464mm. Geothermally heated groundwater rises from the Earth’s crust to the surface, accumulating in the Dallol crater. This creates spectacular and colourful hot springs that are extremely acidic and salty. The area is also characterised by toxic sulphur and chlorine vapours as a result of natural degassing volcanic processes. Living organisms tend to be sensitive to drastic changes in their environments. The cells that make them up can be seriously compromised in extreme physical (relating to temperature, desiccation, radiation, and pressure) and (geo)chemical (such as salinity, pH or heavy metals) conditions. So what could survive in the Danakil’s harsh environment? After a detailed study of the area, we have determined that there’s DNA evidence of microbial life. Life that, because of the similar extreme salty environment with volcanic origin, could be what’s surviving on Mars. The microorganisms able to survive such extreme conditions must be a group of prokaryotes. All living things consist of two cell types: prokaryotes and eukaryotes. Organisms whose cells lack a nucleus and have DNA floating loosely in the liquid centre of the cell are prokaryotes. These are the most common and most ancient forms of life on earth. What these microorganisms need is liquid water, metabolically suitable carbon, energy, and nutrient sources.